Multi-Port Hub for 2016 / 2017 MacBook Pro 13" and 15"
The Kinstar Macbook Pro Hub Adapter is the Most Compact and Fastest Hub which is specifically designed for 2017/2016 MacBook Pro. compatible with both 13" inches and 15"inches. 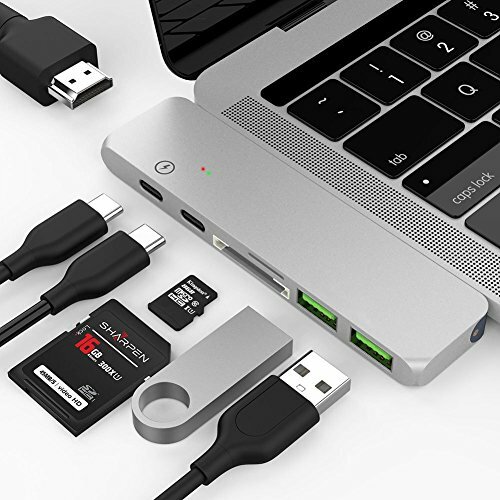 Expand the two USB-C ports on MacBook Pro to 7 ports including Thunderbolt 3, USB-C, HDMI, two USB 3.0 ports, and SD/Micro Card Reader.Match your MacBook Pro with a beautiful color ,aluminum sleek adapter protect you from being scratched. Available in Space Gray and Silver. --Thunderbolt 3 portSupport 5K or 2x4K @ 60Hz video, up to 40Gb/s data speed,pass through charging for both 13" (61W) and 15" (87W) MacBook Pro models. --SD/Micro SD PortUp to 104MB/s Data read, Support SD/SDHC/SDXC, SD3.0 UHS-1, Capacity up to 2TB. We designed to feel like a natural extension of the Apple new Macbook Pro with similar product lines, thickness, right angled edges and rounded corners. Aluminum enclosure texture matched to your Mackbook Pro.